Our new packaging and website design is the result of extensive consultation with you, our customers. 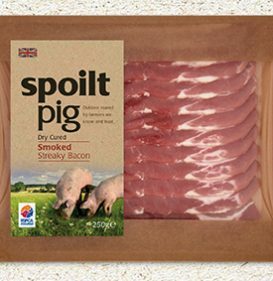 We wanted the packaging to communicate our philosophy and show everyone what spoiltpig is all about. We explored options and tested them in market research groups, you told told us that the chosen labels clearly show we care about the welfare of our pigs while the packs also show off the quality of our wonderful bacon. Visit your local spoiltpig store to see them on shelf, but don’t leave them there, pop one or two in your shopping basket so you can take them home and study them in more detail! Go on, spoil yourself and stock up the fridge.